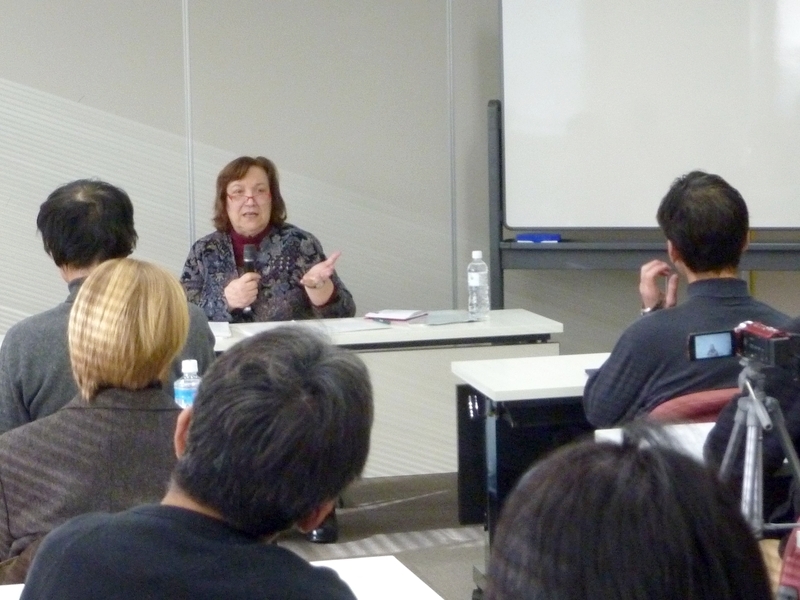 On December 6, 2014, in Osaka, Juliet Winters Carpenter, professor at Doshisha Women’s College and a prolific translator, spoke about translating the work of Minae Mizumura and gave a workshop on a passage from The Fall of Language in the Age of English (Columbia University Press, 2015). 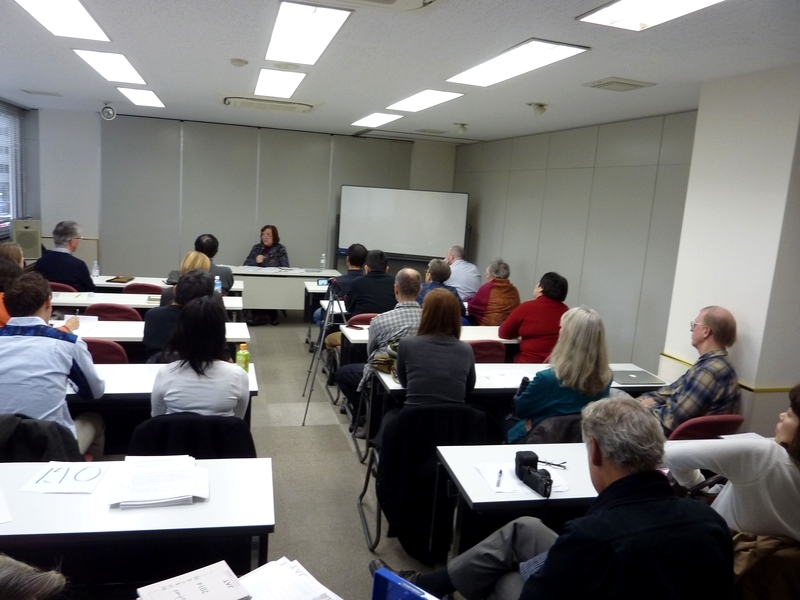 This article, with some of the workshop results included at the end, is based on a transcript of her talk, which focused on Carpenter’s collaboration with Mizumura and the content of the book. I have been giving a number of talks about my contribution to the translation of The Fall of Language in the Age of English. The title of the original is Nihongo ga horobiru toki: Eigo no seiki no naka de (Chikuma Shobō, 2008). 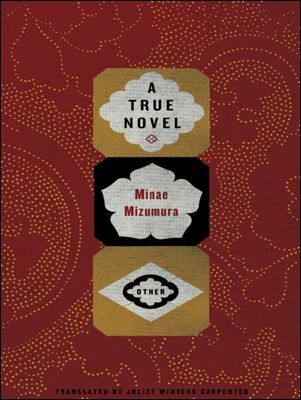 It is, so far, the only non-fiction book Minae Mizumura has published, other than some collections of essays. Mizumura is primarily a novelist, but in Fall she felt compelled to write about the negative impact of the dominance of English on other languages. It is always a challenge to translate Japanese into English, and like any author, Mizumura has a particular style that must also be conveyed. To give you some idea of what is involved in the translation of a book like this, we’re going to look at one particular passage from this book. I chose this passage for two reasons. One is that it presents Mizumura’s main argument: the idea that writers express themselves best in their own language and why that’s important in the age of English. This particular passage describes the moment she discovered this basic premise. The other reason I chose this passage is that it is still pretty close to the original Japanese. Most of the book went through significant changes after a more-or-less direct translation of the original text. 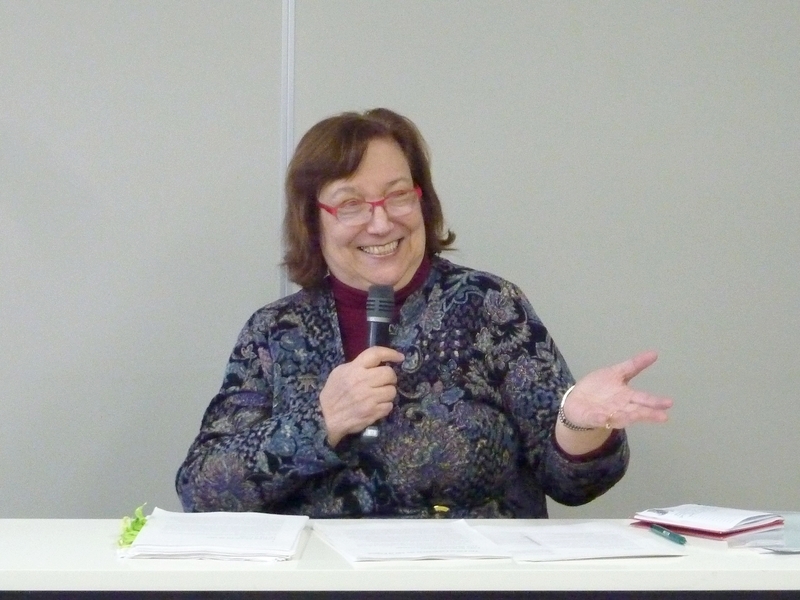 Mizumura rewrote whole chapters in some cases, especially the last chapter (“The Future of National Languages”). She made major revisions in other chapters as well. The translation turned into a project of collaborative rewriting, which says something about the potential for “translation” in the age of English. We followed the same procedure for the translation of Fall as with her other works. First I send her a first draft, in stages, for her to review. I also try to go through it one more time before we meet. Then she travels to Kyoto and stays with a friend while we work through it, chapter by chapter, line by line, word by word. We meet around 1 pm—after lunch so we don’t have to worry about that—and then work straight through till about 9. (We generally take a break for dinner around 7 pm, something she has either prepared or bought at the corner supermarket; occasionally we eat out, to celebrate some milestone.) We do this until we finish, with breaks along the way. Sometimes we work even later into the evening. It’s intense, but we spend a lot of time laughing, and it’s been a rare privilege. As you may have noticed, there are two translators credited for this book; I share the byline with Mari Yoshihara, who was the first translator. Mari Yoshihara is a professor of American Studies at the University of Hawai‘i and a big Minae Mizumura fan. She had read Nihongo ga horobiru toki and asked permission to translate it. Mizumura agreed but thought nothing would ever come of it. Much to her surprise, six months later Yoshihara had completed a draft translation. This is especially impressive in light of the fact that she is a full-time professor and edits a journal. Not only had she completed a draft translation, she had found a publisher, Columbia University Press. Mizumura read Yoshihara’s draft and realized that she needed to rewrite much of the book for a readership unfamiliar with the Japanese language. She also expanded her discussion to include other languages facing similar challenges in this “age of English.” That’s why the title of the English translation is different from the original. The English edition of the book is less about the fall of Japanese and more about the fall of language in this age of English global dominance. You might wonder about the word “fall”—where did that come from? It may strike some as unduly pessimistic. Well, Mizumura is a huge Natsume Sōseki fan—in fact, her debut novel was Zoku meian (Light and Dark, Continued; Chikuma Shobō, 2009), a reference to Sōseki’s last novel, which was unfinished at the time of his death. In the opening scene of Sōseki’s novel Sanshirō, the protagonist is riding the train on his way to Tokyo. He’s going to the big city, leaving his home behind; the world is opening up for him. Talking to the man sitting across from him, he mentions the Russo-Japanese War, which Japan had recently won. It was 1908 and things were looking really good for the nation, but the man says bluntly, “Nihon wa horobiru ne!” (Our translation: “Japan is headed for a fall.”) This clicked with Mizumura, and she turned the expression into her title. It also recurs throughout the book. Mizumura’s family moved to New York when she was twelve, and she grew up on Long Island. But instead of becoming a full bilingual—at that age she could have achieved native English competence, and she’s so brilliant she could have easily done it—she rejected English. She had an encyclopedia of modern Japanese literature at the time—the Gendai Nihon bungaku zenshū, all sixty-three volumes (published by Kaizōsha in 1926–31). She would go home from school and read those books and become immersed in that world. That’s why the language and the ideas of authors like Sōseki are ingrained in her. You might well declare that she made the wrong choice, and she might even agree with you. If someone wanted to be a writer in this day and age—when English is the dominant language—why wouldn’t they want to be a writer in English? Why choose to write in Japanese? But that is the choice she made, or ended up with. Mizumura firmly believes that it is important for other languages, languages like Japanese, to maintain, cherish, and build on the traditions that they have. The passage that members fo the workshop translated comes from the very first chapter, “Under the Blue Sky of Iowa, Those Who Write in Their Own Language.” The idea that led to this book came to her when she participated in the International Writing Program (IWP) hosted by the University of Iowa. She had just finished writing Honkaku shōsetsu (trans., A True Novel) and thought, well, that’ll be a nice vacation. She went just for a month, a truncated version of the program. And while she was there she began to write what would later become Nihongo ga horobiru toki. So this is non-fiction, but in the first chapter she’s still in novelist mode and the writing is sort of like an I-novel, recounting her experiences there and giving vivid descriptions of the people she met. She captures various participants with such clarity and skill, I sometimes wonder how they feel about it now that the book is out! Mizumura illustrates all of the points that come up in our sample passage by mentioning different people at the conference. Some of the writers that participated don’t have freedom of speech in their home country. She writes about a Burmese writer who defected, a Romanian writer, and three people from China who were there, considering how the conditions under which they write must affect how they write. There is a hierarchy among languages, based not on how many people speak them, but on how many of those who do are non-native speakers. A language like Chinese may have the most speakers numerically speaking, but that doesn’t put it on top necessarily, because it’s not widely shared across national boundaries. There’s little likelihood that in the future international financial discussions are going to take place in Chinese. Even if the Chinese population grows, English is likely to remain the dominant language. We’ve had universal languages in the past, like Latin in Europe or Chinese in East Asia, but until the second half of the twentieth century there hasn’t been one on this scale, one that is sitting on top of all the other languages and circulating throughout the world. And the fact that English is so dominant has to have an impact on these other languages. There’s nothing intrinsic to English that makes it deserving to be the universal language. If we had to vote on a dominant language, we might have chosen Spanish or something a little bit easier. Mizumura describes English this way: “The grammar is messy, the vocabulary daunting and the spelling cockeyed, and for many native speakers English pronunciation is a nightmare.” (Fall, 41) But there’s no stopping it, once we’re stuck with it. So we have it now, and we have to deal with it. And so for her, the idea of keeping your language in the age of English is really about keeping the written language, and the written language is maintained through literature, and especially, the novel. The Meiji Restoration occurred during the heyday of the novel in the West, so at that time of Japan’s modernization, people were eager to write and were inspired by novels from the West. But they didn’t just imitate them. In the case of Japan, they produced one of the world’s major literatures. Japanese literature from the Meiji period until quite recently is regarded very highly around the world, and justly so. It has tremendous richness and depth. We owe a lot to translators and scholars like Donald Keene, who brought Japanese literature to the world’s attention. It is comparable to English literature, and this is what Mizumura calls a miracle. Besides European languages such as French and German, how many other languages have a modern literature as great as the modern literature of Japan? It’s something that Japan has that the country can be very proud of. The problem that she gets into in the seventh chapter, the final chapter of the book, is that people are moving away from their national literatures, and she’s very concerned about the quality and the continued development of literature in Japanese. 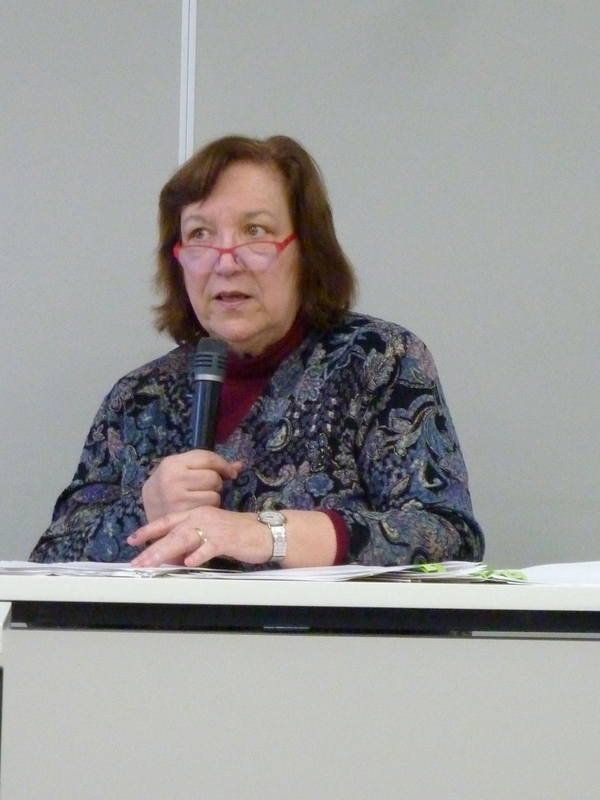 Her book was controversial in Japan because of recommendations that she made about the teaching of English, and sparked a huge online debate from the first. The book had just come out at the time, so many participants in the debate hadn’t read it yet. But I think the title—Nihongo ga horobiru toki—was shocking, and people accused her of being elitist. Basically she’s against the idea that everybody needs to learn English. The education ministry (Monkasho) has lowered the age at which students begin to learn English. Mizumura asks what would happen if American schoolchildren were required to learn Japanese. Let’s have debates in Japanese—can you imagine? It’s not fair to make such a comparison, because Japanese isn’t a dominant language. But the distance between the two languages is the same, so it’s as hard for students here in Japan to learn English as it would be for American students to have to grapple with Japanese. Mizumura thinks that the pressure to learn English is causing terrible angst in the younger generation, and that Japanese people in general are filled with anxiety about their English. Their English is never going to be good enough. They study, and study, and they feel bad about it. Or they just hate it. If they shun English, then they’re isolated, because everybody else is focusing on English and they’ve turned in a different direction. But at the same time Mizumura says that Japan does need people who know English. Bilinguals—in her definition, this means people who can read a language other than their own—are needed because they are the people who throughout history have made communication possible across different cultures and languages. Across Europe, for example, educated people once knew Latin, and knowledge could be shared across cultures. We’re all born seeking knowledge, but certain people will put aside all else to learn other languages; they will go out and find them and bring them back to us. Such people are a precious asset. But not everybody is a seeker of knowledge, and not everybody can master a foreign language. So Mizumura says, let the people who want to do it, do it. Don’t make everybody learn English. Give a self-selected group of devoted bilinguals every opportunity to improve their skills. After this superhuman effort to acquire the Dutch language, when Fukuzawa finally made it to Edo in 1858, he went to Yokohama, thinking, finally I can use my Dutch. But when he gets there and looks around, there’s no Dutch! None of the signs in the windows are in Dutch. He tries to listen to the conversations, but nobody’s speaking Dutch. It’s all English. We can imagine Fukazawa’s disappointment and dismay, but he was also a realist. The next day, he recounted: “I took up a new aim in life and determined to begin the study of English.” (Fall, 132) He made this quick turnaround, all right, but there were no English dictionaries. There were no teachers. There was nothing. And yet, he found a way to do it. The more you know about this era, the more impressive this achievement is. This love of learning, this love of language that it grows into—and it’s all translation. There was just a storm of translation, and people like Fukuzawa helped to make that possible. How? The Japanese language had to be transformed and made into a true national language. That transformation—and the way such transformations have happened all over the world—is the focus of Mizumura’s discussion. Translation is basically asymmetrical. One language is more powerful than the other, and that’s usually why you’re translating. There is a reason for the imbalance between the number of books translated from Japanese to English and the other way around. In the Meiji era, translators had to come up with innovative ways to express foreign concepts. Fukuzawa used kanji to do this. He’s responsible for creating some of the words that are still in use today—like tōron (debate) and enzetsu (speech). Others were doing it too; they were creating new words that have become part of the language. How was Japanese able to adapt? Because people like Fukuzawa had tremendous knowledge and a desire to share it with others. Fukuzawa had a vast store of knowledge of Chinese that he could draw on, to use in expanding Japanese. Kanji, which proved to be a flexible tool for making neologisms, was perfect for the task. This is one reason why we have so many kanji in the language today despite the efforts of some to banish them. Large chunks of the book (65–66; 106–116; 124–25; 183–89; 200–203) are about the history and value of kanji. During and after the American Occupation, one of the goals of the occupiers was to simplify the written language, based on an unproven theory that it would make the populace more literate (and restrict access to prewar propaganda). An early proposal was to get rid of kanji (and also hiragana and katakana) and write Japanese using the Western alphabet. This issue—the value of kanji—has come up again and again. Why do we have kanji? Koreans don’t use kanji. Why do Japanese keep on using kanji? It’s a battle that continues to be fought. After the war, some people thought that we should just get rid of the Japanese language entirely. Nagai Kafu said, let’s all speak French. Various people declared it was the time to make English the official language of the country. Fortunately, saner heads prevailed. It came very close though. Maybe some of you have seen the NHK show on the Occupation. A program led by the American anthropologist John Pelzel conducted a literacy test because surely the Japanese people didn’t know all those kanji and they would prove it and say, see, you don’t need kanji. So they did the literacy test and all kinds of people were happy to participate: young people, old people, people with education, people without. They’d never had such a chance before. They took the test and they came out with flying colors. It turned out that Japanese people were extremely literate and they really knew a lot of kanji. Pelzel called in the Japanese linguist who had helped him make this test and said, let’s fudge the results, it’s in a good cause. Let’s say that everybody flunked the test. Because if we just change the figures here, we’ll be able to push this through and then nobody will be able to argue with us. But the Japanese linguist held his ground and said, I’m a scholar, I can’t do that. So kanji were saved. The book also touches on literary criticism and the history of languages in the East and in the West. 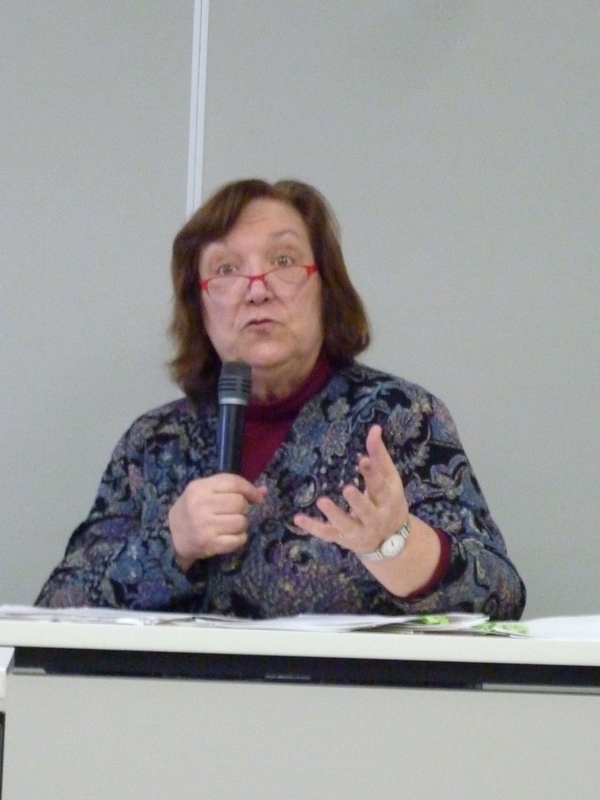 Mizumura describes how language has progressed in Europe, and how, for example, the exam system in China has had such a powerful influence on how people learned language, and not just in China, but in surrounding countries. Mizumura takes us through the history of how the Japanese language got to be what it is today, and how modern Japanese literature came into being. She expresses regret that students often spend more time studying English than Japanese and are never expected to read modern classics or even an entire Japanese book. This is true. They have a Japanese (kokugo) textbook, but it includes only six lines from Sōseki’s novel Kusamakura. Of course students could choose to read it on their own, but they are never assigned an entire book to read. They get a snippet of this and a snippet of that. With classical literature such as The Tale of Genji, it may be more understandable. But even then, they could be assigned a complete chapter of The Tale of Genji, at least. Instead, they read just the bit where young Murasaki finds the little birds and lets them go. So practically everyone in Japan knows that passage by heart, but that’s the only part that they have read. Even we who are native speakers of English would say that not everything has to be global and it’s really a good thing to appreciate the richness of your own language—the language that you have access to and other people don’t. Yes, we’re all human and we all live our lives the same way and have the same emotions. But there are so many different ways of expressing ourselves and what it means to be human. And language does change the way we look at each other and our lives. It is a loss to humanity if we lose one of these literary traditions. The literatures of the world are the world’s treasures. So she wants to encourage people to play a role in their own literature, prizing it (primarily by reading it), and thereby maintaining and nurturing the diversity that enriches humanity. Mizumura believes that Japanese have a lack of confidence in their language—they somehow don’t think Japanese is good enough—and at the same time, an overconfidence. This drives her crazy. The Japanese figure that they don’t have to worry about learning Japanese. They think: we’ll never not be Japanese; Japanese culture is safe. But it really isn’t. With the exception of the American Occupation, Japanese have never had to defend their culture from foreign invasion. For centuries they were just far enough away from China that they didn’t have to worry about being invaded. Consequently, they didn’t have to keep asking themselves, what do we have that we want to defend? They could kind of take the stability of their culture for granted. Mizumura is saying that language isn’t necessarily in the DNA; it has to be nurtured, and people need to take pride in it and not feel guilty about it. There’s guilt left from the war, when the Japanese language was forced on Japan’s colonies. Regret about that history is behind a reluctance to assert pride in their language for fear they’ll sound too insensitive, too right wing. So there are a number of reasons why Japanese have these mixed feelings about their language. In the West we have been moving away from the idea of a canon because it tends to be “dead, white, and male,” as they say. But still, everyone educated in the West has read Shakespeare. It’s part of the culture we share. Maybe you haven’t read all of Shakespeare’s works, but you’ve read some Shakespeare, a complete play or two, and you’ve had a discussion about it. You’ve encountered it; it’s meant something to you in your education. Mizumura would like to see that kind of canon established in Japan. Chapter 6 focuses on the influence of the Internet. There are different ways of looking at how the Internet and advanced technology in general are going to impact language issues. Some people say the Internet is great, because it will preserve languages that might otherwise go extinct—that they will always be there, on the Internet. But at the same time it’s true that as more and more information circulates in English, who’s going to take the time to translate it into all these other languages? Everything happens so quickly on the Internet. It changes everything. In the past, we had all kinds of time to do these things. But things have speeded up so much that translators are pretty hard pressed to keep up. So people who have access to English on the Internet have so much more access to information than people who don’t. It creates a two-tier system. And that’s probably just going to get more extreme as time goes on. So everything will be interlinked. But it’s not that easy—obviously this is a dream of the future. And people forget about language when they talk about these kinds of utopias. Unless people can read it, written language is meaningless. English is the universal language of the Internet and of Internet technology itself. We need people to access a wealth of knowledge; at the same time, it is a tremendous loss if we neglect to include books like Sanshirō. Part of the greatness of Sōseki is that he managed to straddle cultures. We think of him as a Japanese novelist influenced by English literature, but his work also drew heavily on Chinese literature. He wrote a vast number of things in Chinese (kanbun), but who reads them now? There is a gap in Japanese literature: anything written before the Meiji period is inaccessible to most Japanese readers today. Pride and Prejudice, which was written before the Meiji Restoration, was a book my son read in high school. We have access in our English literature classes, without any kind of mediation, to Jane Austen’s book exactly the way she wrote it. Japanese people, by contrast, are cut off in a very real way from their past because they reinvented their language. It intrigued me that people were writing under such entirely different conditions, and even more so that people were writing in so many different languages. The longer I stayed with the other writers, the more I thought about that. Even though I found myself gradually getting used to the fact that people write in all kinds of places around the globe—in rich and poor countries and even in places where freedom of speech is suppressed—I kept being intrigued by the fact that people write in so many different languages. All over the world, all sorts of writers write in all kinds of languages—or more precisely, in “their own language.” For these writers, it does not matter whether they write in a language that has a potential readership of several hundred million or only a tiny fraction of that number, nor whether their language has been existing as a written language for several thousand years or only a few decades. They write with passion and commitment, just as if writing in one’s own language were the most natural thing to do, and always had been. In reality, of course, people have not always been writing in their own language. The day when “writing” started to mean “to write in one’s own language” does not date back very far—a few centuries for some countries, a few decades for others. Nevertheless, today, people write in their own language as if it had always been that way. They write not only in English, Spanish, or Mandarin; they write in languages such as Mongolian, Lithuanian, Ukrainian, Romanian, Vietnamese, Burmese, and Croatian. Furthermore, it amazed me to see how closely the act of writing in one’s own language is linked to the feelings writers nurture towards their home country. I thought about it over and over: what a variety of conditions people are writing under. But there was something else I also thought about over and over: what a variety of languages people are writing in. During the time I spent with the other writers, that thought only grew deeper and deeper. Gradually I got used to the idea that people are writing in every sort of place on Earth, in rich countries and in poor—writing even with their freedom of speech suppressed. But the sheer variety of languages in which humans write never ceased to amaze me. In every sort of place on Earth, all kinds of writers are writing in all kinds of languages. More than that, all kinds of writers are each writing in their own language. Whether that language has potential readers numbering in the hundreds of millions or in the tens of thousands, whether that language has had the written word for several thousand years or several dozen, for the writer, it’s all the same. Writers are writing passionately and seriously in their own languages as though this were the most natural of acts. As though people have been writing in their own languages for as long as human beings have existed in this world. As though it’s always been that way. But, of course, it hasn’t always been that way. “To write” came to mean writing in one’s own language only in the modern age. The history of writing varies in length depending on the language and may go back only a few hundred years, or several dozen at the shortest. Yet for writers now, it’s as though for as long as human beings have existed in this world, people have been writing in their own languages. Writing not only in English, Spanish, and Chinese, but also in Mongolian, Lithuanian, Ukrainian, Rumanian, Vietnamese, Burmese, Croatian, etc. And the act of writing in one’s own language is connected deeply with the love of one’s own country. I thought about it again and again: under what very different circumstances people are writing. But there was something I kept thinking about even more: how many different languages people are writing in. And during my time with the other writers those thoughts grew ever stronger. It gradually sank in that people are writing in every corner of the globe, in rich countries and poor, and in countries where freedom of speech is suppressed; but my surprise that people are writing in so many different languages never wore off. In every corner of the globe, different writers are writing in different languages; or rather, different writers are writing in their own language. It makes no difference to them whether their language has a potential readership of hundreds of millions or only hundreds of thousands, whether it has been a written language for thousands of years or less than a hundred. Writers are each writing in their own language passionately, earnestly, and as though it were the most natural thing in the world, writing as though people had always done so. Of course, it is not true that people have always written in their own language in ages past. Only in the modern era has writing come to mean writing in one’s own language, and the history of writing varies from language to language; often it goes back only a few hundreds, or mere dozens, of years. In spite of this, now writers are writing as though they had always been doing so since humans first existed on this planet. They are writing not just in languages like English, Spanish, and Chinese, but in Mongolian, Lithuanian, Ukrainian, Romanian, Vietnamese, Burmese, Croatian—the list goes on. Moreover, the act of writing in one’s own language—how deeply connected that is with one’s sentiments for one’s own country. I thought it time and time again: People, it would seem, write under a vast variety of conditions. And yet there was something else I repeatedly thought, even more so: People write in an amazing variety of languages. This thought only continued to take root deeper within me during the time I spent with the other authors. That people write in all corners of the earth—the fact that they write in countries rich and poor alike, even when freedom of speech is suppressed—is something I gradually grew accustomed to. Nevertheless, the fact that people write in such a stunning variety of languages was something that continued to surprise me until the very end. All around the world, authors are writing in a variety of languages, and not just that—they are writing each in their own language. To the respective authors, it makes no difference if their native tongue has hundreds of millions of potential readers or only thousands; it makes no difference if their language has had a writing system for thousands of years or mere decades. By the same token, authors write in their own languages fervently, earnestly, and above all in a fashion that seems completely natural. It is as if, so long as humanity has existed, people have always written in this very way. Of course, that is not true. The word “writing” came to mean writing in one’s own language only after the start of the modern age, a period of time which varies by language but can be as long as several hundred years or as short as mere decades. Nevertheless, in the present day authors write in their own languages as if people have always done so. It is not just English, Spanish, or Chinese that people write in, but Mongolian, Lithuanian, Ukrainian, Romanian, Vietnamese, Burmese, Croatian, and so on. Moreover, that act of writing in one’s own language is very deeply connected to a love for one’s own country. A thought kept coming back to me—that people write under all conditions imaginable. And more so, that people write in so many different languages. While in the company of these authors, this idea kept returning to my mind and growing inside me. People write in every corner of the world. They write in countries both rich and poor. They write in places where freedom of expression is curtailed. After some time I came to accept this reality, but to the very end I have remained awed by the fact that people write in so very many languages. Yes, authors around the world write in different languages, but more precisely, they each write in their mother tongue—whether the potential readers of that language number in the hundreds of millions or merely hundreds of thousands, whether their language has had a written form for thousands of years or mere decades. To an author it does not matter. Authors write in their mother tongue with passion and seriousness as if this were the most natural of acts, as if writing in one’s native language were what people have always done as long as humanity has been around. Of course, that is not the case. Writing came to mean writing in one’s native tongue only in the modern age. But authors today write in their mother tongue as if people have always done so—not only in English, Spanish, or Chinese, but in Mongolian, Lithuanian, Ukrainian, Rumanian, Vietnamese, Burmese, Croatian. You name it. And that very act of writing in one’s own native tongue is deeply connected to an appreciation of one’s country. Once again I was struck by this discovery: How strange that people write in such vastly different situations! And again I found myself mulling yet another thought: What a lot of different tongues people write in! The more time I spent with these writers, the deeper this feeling grew, taking hold within me. People write in every corner of the world, from affluent nations to the lands of the destitute. Even in oppressed domains lacking freedom of speech, still they continue to write. Eventually I grew used to this idea. But the idea that people write in so many tongues continued to surprise me to the very end. In every corner of the globe, myriad writers scribble away in an assortment of languages—each in their own tongue. For some languages there are several hundred million potential readers, for others only several hundred thousand. Some cultures have had a written language for several thousand years, and others developed written forms mere decades ago. Despite these differences, for a writer it is all the same. All writers scribble their words with passion and seriousness, and people have always written in their own tongue as if to do so were the most natural thing in the world. Of course, it has not always been so. It was only in modern times that writing came to equate to writing in one’s own tongue. Depending on the language, the history of writing goes back only several centuries or even decades. In spite of this short tradition, writers write in their own tongue as if that has been the way for as long as people have inhabited this world. They write in their mother tongue, not only in English and Spanish and Chinese, but in Mongolian and Lithuanian, in Ukrainian, Romanian, Vietnamese, Burmese, and Croatian. And this act of writing in one’s own tongue is an act deeply intertwined with the love one holds for one’s own culture and country, rooted deep in one’s identity. That all these writers just kept on writing, whatever their circumstances, never ceased to amaze me. Yet there was something else that never ceased to amaze me—something that actually seemed more amazing as the days went by. Yes, writers are writing in all corners of the world. Yes, they are writing in countries rich and poor. Yes, they are writing despite threats to their freedom of speech or even to their very lives. Nonetheless, what intrigued me most as I continued to live with the IWP writers was that all of us, each and every one, were writing in our own language. Not only there in Iowa but everywhere on Earth, all kinds of writers were writing in their own language. It made no difference whether a writer’s language had hundreds of millions of potential readers or a few hundred thousand; either way, they wrote in their own language, as if to do so were the most natural act imaginable—as if people had always done so, ever since the human race came into being. Of course, that is far from the truth. If one looks at human history, only in the modern era did the act of writing come to mean writing in one’s own language. While the length of the history of writing varies from language to language, it is often a matter of a few hundred years or even a few decades. And yet, today, writers everywhere are writing in their own language as if people have always done so. Moreover, at the IWP, for each writer, how deeply this notion of one’s own language seemed to be connected to our feelings for our own country! First of all, readers should bear in mind that the above version is based on an original translation by Mari Yoshihara, and on discussions with the author. One thing that translators soon become aware of is the difference in rhythm between Japanese and English; repetition creates a flowing, pleasant style in Japanese, but English readers have a low tolerance for it. Concision and clarity count for much more. Using the word “yes” to introduce a familiar idea is one way to slip in repetition without seeming to insult the reader’s intelligence. The points marked with “yes” above have all been made in an earlier section of the text; by prefacing them this way the reader is led to focus less on them and more on what is new in this section. Another device that I think English readers have a rather low tolerance for is the use of italics for emphasis. (Unlike Japanese, quotation marks are of course NOT used for emphasis in English.) In Japanese, it works fine to mark every single occurrence of the phrase「自分たちの言葉」with quotation marks, but in English we ended up italicizing the phrase “one’s own language” just twice, once per paragraph. Some of the changes are additions or deletions that Mizumura and I talked over. The original doesn’t mention threats to writers’ lives; this is something that she wanted to add. We took out the list of languages. Several participants mourned this loss and mentioned how much they enjoyed having it there—but at any rate, we ended up cutting it as nonessential. Another set of changes has to do with the background of the comments. 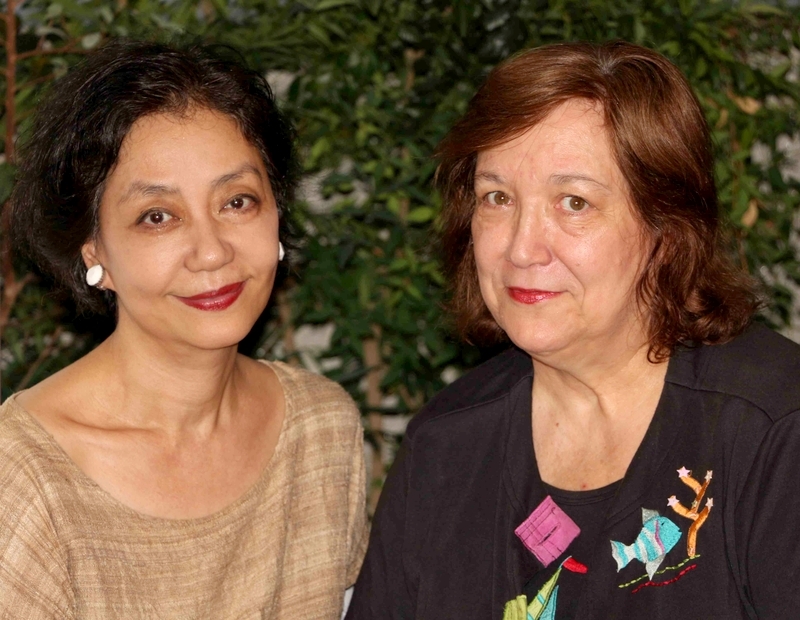 The translation emphasizes the connection to the International Writing Program (IWP) that Minae was then participating in. Thus in paragraph two, rather than repeating “these writers” (what writers? ), we used “IWP writers.” In the next sentence, too, “Not only them, but everywhere on Earth” became “Not only there in Iowa but everywhere on Earth”—more specific, more interesting, and now we are comparing places rather than people and places. The final thought of the excerpt is also tied to these specific writers, which helps the transition to the next section, where various writers she encountered at the program are introduced in detail. Also throughout the passage I brought Mizumura herself more into the comments, since she is indeed one of the IWP writers and one of those writing in their own language. In short, the translation can differ from the original in significant ways—sentence structure, paragraphing, emphasis—but the goal of all such changes is to aid the reader in understanding and appreciating the author’s thoughts, and to maintain focus so those thoughts come through loud and clear.